I have the abilities to reach into the Skies. I understand the basics of All. this feeling has vanished completely. and so will the lower Clouds. And abilities make no sense anymore. it’s about learning and observing. every leaf tells about its own life. with all liberty to move. creating an eternal change of light. Just some questions with a few answers. Words are a small part in our consciousness. Our Intuition appears to be so much bigger, by far. In deep silence we know what to do. And we can let our Inner World talk. They really know the truth. 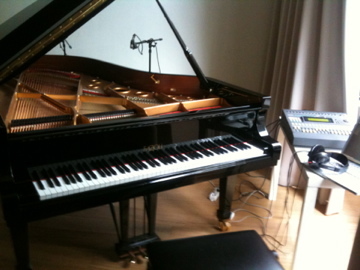 Fazioli is a famous instrument for pianists. Enjoy the beauty of the sound! To make place for new Series. Today’s PianoTweet is the last one in this F sharp minor Series. Which will be as temporarily as well. give space to a new Life. appears to be a life on its own. I really do not know what this music is about. It’s an improvisation, a tryout, a search. I had no idea where these notes came from. directing my fingers and both my hands. One could call it a mystery, a problem or a challenge. There’s so much we do not know anything about.